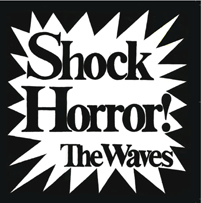 Bongo Beat: The Waves: Shock Horror! After the Soft Boys broke up, lead guitarist Kimberley Rew was offered the remainder of their recording contract and released several UK singles which were compiled into the legendary Bible of Bop album, which gathered up his solo sessions with The Soft Boys, the DBs, and the Waves. The Waves were a group that he and drummer Alex Cooper had in 1976 and disbanded once Kimberley joined the Soft Boys. Sometime around 1981, Kimberley re-connected with Alex, who at the time had discovered singer Katrina Leskanich and (then) rhythmn guitarist Vince de la Cruz and was touring US army bases as Mama's Cookin'. With Kimberley joining the band, they reverted back to The Waves with Kimberley and Katrina sharing lead vocal duties (it would be another 6 months before everyone realized the full potential of this new band). The Waves did some recordings that were issued as singles and compiled on Kimberley Rew's Bible Of Bop lp. The remainder of their sessions were released as a mini-lp called "Shock Horror!" and contains the first recorded version of "Going Down To Liverpool" (this song was later re-recorded for the first Katrina & The Waves album and then re-recorded a THIRD time for their Capitol Records bebut). Another song, "Brown Eyed Son" would also follow that route after its debut here. Released only in England in 1982, Shock Horror! also compiles the very first seventies recordings of The Waves produced by Pat Collier (who would go on to produce Robyn Hitchcock & the Egyptians, Wonderstuff, Primal Scream). "Shock Horror!" has held a special place over the years for many record collectors and it is finally available for the first time on cd in a deluxe digi-pak with liner notes by Ralph Alfonso and full recording details in addition to rare vintage photos and interviews with all band members. The Waves would soon morph into Katrina & The Waves and their next release would be on Attic Records Canada and include "Walking On Sunshine"